“Battle Creek” redirects here. For other uses, see Battle Creek (disambiguation). 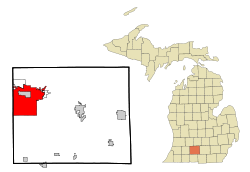 Battle Creek is a city in the U.S. state of Michigan, in northwest Calhoun County, at the confluence of the Kalamazoo and Battle Creek Rivers. It is the principal city of the Battle Creek, Michigan Metropolitan Statistical Area (MSA), which encompasses all of Calhoun county. As of the 2010 census, the city had a total population of 52,347, while the MSA population was 136,146. Battle Creek, known as the "Cereal City", is the world headquarters of Kellogg Company, founded by Will Keith Kellogg in 1906, whose brother, Dr. John Harvey Kellogg, invented cold breakfast cereal as an alternative to the traditional meat-based breakfast. It is also the founding location of Post Cereals which is now Post Foods, as well as the location of a Ralston Foods cereal factory owned by Ralcorp. Dr. John Harvey Kellogg, director of the Battle Creek Sanitarium, was featured in the T.C. Boyle novel The Road to Wellville and the movie of the same name. The Battle Creek Sanitarium, which is now the Battle Creek Federal Center building, is still one of the tallest buildings in Battle Creek. This building is a historical marker to the city and the state of Michigan. In 1982, voters approved merging Battle Creek Township with the city of Battle Creek, under pressure from Kellogg Company, which threatened to move its headquarters away from Battle Creek if the city and township did not merge. Battle Creek is currently the third-largest city in Michigan by area, after Detroit and Grand Rapids. The name "Battle Creek" had its origin in a skirmish between a government land survey party led by Colonel John Mullett and two Native Americans. According to various accounts, while Mullett and his group were surveying an area several miles from the present city in the winter of 1823-1824, the work of the survey party was interrupted by Native Americans. Two members of the party, who remained at the camp, were attacked by two Indians, reportedly attempting to steal the party's provisions. During the fight, shots were fired from a rifle, and the two white men subdued the Indians, inflicting a serious injury to one of them. The survey party promptly left the area and did not return until June 1824, after Governor Cass had settled the issue with the Indians. Due to this incident, the nearby stream was called the Battle Creek River. The river was formerly known by the Native American name of Waupakisco, to which some attribute a folk etymology for the name. By this account, the name Waupakisco or Waupokisco was a reference to an earlier battle fought between Native American tribes before the arrival of white settlers. However, Virgil J. Vogel establishes that this native term had "nothing to do with blood or battle". The first permanent settlements in Battle Creek Township began to be made about 1831, with most choosing to locate on the Goguac prairie, which was fertile and easily cultivated. A post office was opened in Battle Creek in 1832 under Postmaster Pollodore Hudson. The first school was taught in a small log house about 1833 or 1834. Asa Langley built the first sawmill in 1837. A brick manufacturing plant, called the oldest enterprise in the township, was established in 1840 by Simon Carr, and operated until 1903. The township was established by act of the legislature in 1839. Battle Creek figured prominently in the early history of the worldwide Seventh-day Adventist Church as the location of its first hospital, college, and location of the church's founding convention in 1863. During the Civil War era, the city was a major stop on the Underground Railroad. It was also the chosen home of Sojourner Truth. According to the United States Census Bureau, the city has a total area of 43.73 square miles (113.26 km2), of which, 42.61 square miles (110.36 km2) of it is land and 1.12 square miles (2.90 km2) is water, making Battle Creek the third largest city in Michigan by area, and one of only three incorporated municipalities in the state over 40 sq mi (100 km2) in size. Approximately 60% of the city's land is developed. Of the remaining 40% of undeveloped land, 38% is zoned agricultural, 26% is zoned general industrial, 17.5% is zoned residential, 16% is the Fort Custer Army National Guard Base/Industrial Park, and 2.5% is zone commercial. After Battle Creek Township merged into the city of Battle Creek in 1983, the city's declining population rose by nearly 18,000 new residents, but the city continues to decline in population. Prior to the merge, the city measured 18.6 square miles (48.17 km2). Battle Creek is variously considered to be part of West Michigan or Southern Michigan. The local daily newspaper and newspaper of record is the Battle Creek Enquirer, owned and operated by Gannett Company. WBCK (930 AM), the city's heritage radio station, now broadcasting a sports format. AccessVision Public-access television on Comcast channel 16 & 17. AccessVision broadcasts to all municipalities within Battle Creek, and Newton Township. WNWN-FM and WKFR are typically the top-rated radio stations in the market. The area can also receive radio and TV broadcasts from Grand Rapids, Kalamazoo, Lansing and other nearby cities. The Battle Creek Field of Flight Entertainment Festival is an air show and balloon event held yearly in Battle Creek. Battle Creek is home to The Music Center, which serves South Central Michigan. Battle Creek is the home to The Battle Creek Symphony Orchestra, whose home is at the W.K. Kellogg Auditorium in downtown Battle Creek. The symphony is currently conducted by Anne Harrigan, and is Michigan's longest-running symphony orchestra. Leilapalooza - The Leila Arboretum Music Festival is a free summer music festival held at the Leila Arboretum. Proceeds benefit the Leila Arboretum Society and Kingman Museum. Battle Creek is host annually to the Michigan High School Athletic Association team wrestling, volleyball, baseball, and softball state championships. The town receives quarterly boosts to its economy from the fans that flock there to follow their teams. Each year, Battle Creek hosts the Sandy Koufax 13S World Series, for 13-year-old baseball players. In August, 2010, Battle Creek was host to the eighth edition of the International H.K.D Games. The Battle Creek Bombers are a collegiate baseball team, a member of the Northwoods League, who began play in 2007. After a last place finish in 2010, the Bombers went 47-26 in 2011 and won their first NWL championship. It was the first championship in Battle Creek since 2000, when the Michigan Battle Cats won the Midwest League championship. The team's home is C.O. Brown Stadium. In 2011, the team signed a 5 year lease which guarantees the teams 10 year anniversary in Battle Creek in 2017. The Battle Creek Knights are a minor league basketball team. They were a charter member of the International Basketball League (IBL) and went 21-0 during the league's first season in 2005, winning the championship. The team's home is Kellogg Arena. After announcing in July 2009 that they would sit out the 2009 season, in October the team announced that they would return to play in the International Basketball League. The Battle Creek Revolution are a member of the All American Hockey League and began play in 2008. The team's home is Revolution Arena. The Battle Creek Blaze is a not-for-profit, adult football team that plays NFL rules football as a member of the IFL (Interstate Football League). The Blaze organization raises funds and community awareness in the fight against cancer. They are in their sixth season of operation, and won the IFL North Division Championship in 2010. The Battle Creek Cereal Killers roller derby team began in 2011. The Michigan Battle Cats/Battle Creek Yankees/Southwest Michigan Devil Rays were a Class A minor league baseball team that played in the Midwest League from 1995 through 2006. The team's home was C.O. Brown Stadium. The Battle Creek Crunch, were a member of the Great Lakes Indoor Football League (GLIFL), that began play in 2006. They played only one season in Battle Creek before ceasing operations due to financial trouble. The team's home was Kellogg Arena. The Battle Creek Belles, a member of the All-American Girls Professional Baseball League, played two seasons, 1951 and 1952, before relocating to Muskegon. In 1982, at the insistence of the Kellogg Company, the city annexed Battle Creek Township, nearly doubling the city's population. Kellogg's even went so far as to threaten moving their headquarters if the annexation failed to occur. As of the census of 2010, there were 52,347 people, 21,118 households, and 12,898 families residing in the city. The population density was 1,228.5 inhabitants per square mile (474.3 /km2). There were 24,277 housing units at an average density of 569.7 per square mile (220.0 /km2). The racial makeup of the city was 71.7% White, 18.2% African American, 0.7% Native American, 2.4% Asian, 2.7% from other races, and 4.3% from two or more races. Hispanic or Latino of any race were 6.7% of the population. There were 21,118 households of which 33.6% had children under the age of 18 living with them, 37.1% were married couples living together, 18.5% had a female householder with no husband present, 5.5% had a male householder with no wife present, and 38.9% were non-families. 32.6% of all households were made up of individuals and 12.1% had someone living alone who was 65 years of age or older. The average household size was 2.41 and the average family size was 3.04. The median age in the city was 36.3 years. 26.1% of residents were under the age of 18; 9% were between the ages of 18 and 24; 25.9% were from 25 to 44; 25.5% were from 45 to 64; and 13.4% were 65 years of age or older. The gender makeup of the city was 47.9% male and 52.1% female. As of April 2013, Battle Creek has the fifth largest Japanese national population in the State of Michigan, 358 people. As of the census of 2000, there were 53,364 people, 21,348 households, and 13,363 families residing in the city. The population density was 1,246.0 per square mile (481.1/km²). There were 23,525 housing units at an average density of 549.3 per square mile (212.1/km²). The racial makeup of the city was 74.65% White, 17.80% black or African American, 1.94% Asian, 0.77% Native American, 0.01% Pacific Islander, 2.11% from other races, and 2.72% from two or more races. 4.64% of the population were Hispanic or Latino of any race. There were 21,348 households out of which 32.3% had children under the age of 18 living with them, 41.9% were married couples living together, 16.1% had a female householder with no husband present, and 37.4% were non-families. 31.6% of all households were made up of individuals and 12.1% had someone living alone who was 65 years of age or older. The average household size was 2.43 and the average family size was 3.04. In the city the population was spread out with 27.2% under the age of 18, 8.7% from 18 to 24, 29.5% from 25 to 44, 21.0% from 45 to 64, and 13.5% who were 65 years of age or older. The median age was 35 years. For every 100 females there were 91.9 males. For every 100 females age 18 and over, there were 87.2 males. The median income for a household in the city was $35,491, and the median income for a family was $43,564. Males had a median income of $36,838 versus $26,429 for females. The per capita income for the city was $18,424. About 10.7% of families and 14.4% of the population were below the poverty line, including 17.5% of those under age 18 and 11.8% of those age 65 or over. The City of Battle Creek has a commission/manager form of government. Cities that follow this plan of government have an elected commission (or council) that appoints a professionally trained and experienced manager to administer the day-to-day operations of the city and to make recommendations to the city commission. Battle Creek also appoints a City Attorney, who provides legal counsel to the City Manager and City Commission. The City Commission makes all policy decisions, including review, revision and final approval of the annual budget, which is proposed annually by the City Manager. The City Manager serves as an "at-will" employee and he works under an employment contract with the commission. All other city employees, with the exception of the City Attorney’s staff, are under the supervision of the City Manager. There are five ward commissioners. Residents cast votes for a ward representative, who must live within the area they are representing, as well as for four at-large commissioners. These candidates may live anywhere in the city. All commissioners serve two-year terms and all terms begin and end at the same election. The next commission election will be fall of 2011. Each November, the commission holds a special meeting to decide which commissioners serve as Mayor and Vice Mayor for the next year. The Mayor presides over the commission meetings and appoints commissioners and residents to special committees. He may also form special committees to explore community challenges or potential policies. The Vice Mayor stands in if the Mayor is unavailable. Kellogg Community College, a 2-year college founded in 1956. Lakeview High School including Lakeview High School Library an American Library Association award recipient in 2008. Battle Creek Area Mathematics and Science Center, an accelerated secondary school that focuses primarily on math and science education. Calhoun Area Career Center, provides career and technical education to primarily 11th and 12th grade students. Freemason Building, one of the oldest lodges still active in Michigan. Founded in 1917, Camp Custer, as it was then known, would over the next decades serve as a training ground from World War I until the present. Parts of the base were spun off to become the Battle Creek Veteran's Hospital, Fort Custer National Cemetery, Fort Custer Recreation Area and Fort Custer Industrial Park. This industrial Park contains more than 90 different companies. The United States Government still owns the land, but it is now administered and managed by the state of Michigan. The base, which is still mostly undeveloped, wooded land takes up a sizable portion of Battle Creek's land area. The part of the base in Battle Creek that is now the industrial park measures 4.69 square miles (12.15 km2) in area, which is approximately 10.6% of the city's area. A much larger part of the base lies in Kalamazoo County. The adjoining W.K. Kellogg Airport is a joint civilian-Air National Guard facility. Battle Creek is situated on I-94 midway between Detroit and Chicago. The Battle Creek Amtrak Station serves Amtrak trains on the south end of the station and Greyhound and Indian Trails bus lines on the north side of the station. The station is located downtown at 104 Capital Avenue SW, Battle Creek, MI 49017. The Battle Creek Transit provides public transit services to Battle Creek area residents. Regular route bus service is provided throughout the City of Battle Creek. Kalamazoo's Kalamazoo-Battle Creek International Airport serves Battle Creek. Locally, W. K. Kellogg Airport serves the general aviation needs of the community. The airport is also home to Western Michigan University's College of Aviation, Duncan Aviation, WACO Classic Aircraft Corp. the world's only bi-plane manufacturer, and formerly, the Michigan Air National Guard's 110th Fighter Wing which flies the A-10 and O/A-10 aircraft. Kalamazoo Watershed 04050003 The Kalamazoo River runs through Battle Creek. Battle Creek River Watershed The Battle Creek River merges with the Kalamazoo River close to downtown. Battle Creek's official Sister City is Takasaki, Japan, a relationship that is more than 25 years old. Takasaki later established Sister City relationships with Santo Andre, Brazil; Chengde, China; Pilsen, Czech Republic and, in 2006, Muntinlupa City, the Philippines. These cities take turns hosting an environmental conference each year to allow technical and administrative staff to share ideas and projects for addressing environmental concerns. Battle Creek and Takasaki also organize junior high and high school student and teacher exchanges each summer. When the TV show The Beverly Hillbillies was first aired in the 1960s, Kellogg's was a main sponsor, and the theme song continued longer than it does in reruns today. Jed pointed to a billboard ad of Kellogg's Corn Flakes, and the singer went on: "Now come along and visit with the Clampett family, as they learn the simple pleasures in the hills of Beverly. That includes the products of the sponsor of the week, the cereals of Kellogg's, Kellogg's of Battle Creek". ^ "City of Battle Creek, Michigan". City of Battle Creek, Michigan. http://www.battlecreekmi.gov/. Retrieved August 25, 2012. ^ Newkirk, Barrett (2009-11-12). "Baldwin looks to share honor". Battle Creek Enquirer. http://www.battlecreekenquirer.com/article/20091112/NEWS01/911120319/Baldwin+looks+to+share+honor. Retrieved 2009-11-12. ^ Schirripa, Nick (2008-12-03). "Done deal: Tsuchiyama named city manager". Battle Creek Enquirer. http://www.battlecreekenquirer.com/article/20081203/NEWS01/812030311. Retrieved 2008-12-03. ^ "Ralcorp Holdings". Ralcorp Jobs. http://www.ralcorpjobs.com/Ralstonfoods/?location=BattleCreek. Retrieved October 11, 2012. ^ "Battle Creek". Second wave. http://swmichigan.secondwavemedia.com/Cities/BattleCreek/. Retrieved October 10, 2012. ^ a b Peirce, Henry B. (2005) . "The City of Battle Creek". History of Calhoun county, Michigan. Ann Arbor, Mich.: University of Michigan Library. p. 79. http://quod.lib.umich.edu/cgi/t/text/pageviewer-idx?c=micounty;cc=micounty;idno=bad0868.0001.001;size=l;frm=frameset;seq=119. Retrieved 2008-01-25. ^ Indian names in Michigan, origin of "Battle Creek". Books.google.com. http://books.google.com/books?id=T5d5wS7so14C&pg=PA152&lpg=PA152&dq=battle+creek+name+origin&source=web&ots=VaQav_UozE&sig=oA31UESmxR2ebI9PlwquP3Tg940#PPA153,M1. ^ Ringes, Laura (1913). "Battle Creek Township". In Washington Gardner, History of Calhoun County, Michigan, Vol. I, pp. 169-73. The Lewis Publishing Company. ^ "Weatherbase". http://www.weatherbase.com/weather/weather.php3?s=019937&refer=. Retrieved 2008-03-07. ^ "Our history". Battle Creek Enquirer. http://www.careerbuilder.com/Jobs/Company/C31MB74KSLGGPHRV08/Battle-Creek-Enquirer-Battle-Creek-MI/. Retrieved February 14, 2011. ^ "Daily newspaper". Battle Creek Enquirer. http://www.battlecreekenquirer.com. Retrieved February 14, 2011. ^ "Brass Band of Battle Creek". Bbbc.net. http://www.bbbc.net. Retrieved 2011-12-12. ^ . http://www.battlecreekenquirer.com/article/20120615/NEWS01/306150040/MHSAA-baseball-softball-tourney-boosts-local-economy. Retrieved 2013-12-04. ^ "League News | Northwoods League | Get Ready for the Show! | Summer Collegiate Baseball". Northwoods League. August 19, 2011. http://www.northwoodsleague.com/Story.aspx?ArticleId=1330. Retrieved October 11, 2012. ^ "Michigan Battle Cats - Wikipedia, the free encyclopedia". En.wikipedia.org. http://en.wikipedia.org/wiki/Michigan_Battle_Cats#Houston_Astros_affiliate:_1999_to_2002. Retrieved October 11, 2012. ^ "Multinational Monitor, November 1982". Multinationalmonitor.org. http://multinationalmonitor.org/hyper/issues/1982/11/audette.html. Retrieved 2011-12-12. ^ Battle Creek government description. ^ "City of Battle Creek 2010 Comprehensive Annual Financial Report" (PDF). http://www.battlecreekmi.gov/Assets/finance/audit+reports/FY+2011/City+of+Battle+Creek+CAFR+63011.pdf. Retrieved February 13, 2011. ^ "Pennfield Schools Web Site!". Pennfield.k12.mi.us. http://www.pennfield.k12.mi.us/. Retrieved 2013-12-04. ^ "Lakeview High School Library". http://remc12.k12.mi.us/lhslib. Retrieved September 18, 2013. ^ "Award recipient". American Library Association. 2008. http://www.ilovelibraries.org/lovemylibrarian/winners.cfm. Retrieved September 18, 2013. ^ "Waco Classic Aircraft home page". Wacoclassic.com. http://www.wacoclassic.com/. Retrieved 2013-12-04. ^ "The Beverly Hillbillies". Tvparty.com. http://www.tvparty.com/recbev.html. Retrieved 2011-12-12. This page uses content from the English language Wikipedia. The original content was at Battle Creek, Michigan. The list of authors can be seen in the page history. As with this Familypedia wiki, the content of Wikipedia is available under the Creative Commons License.